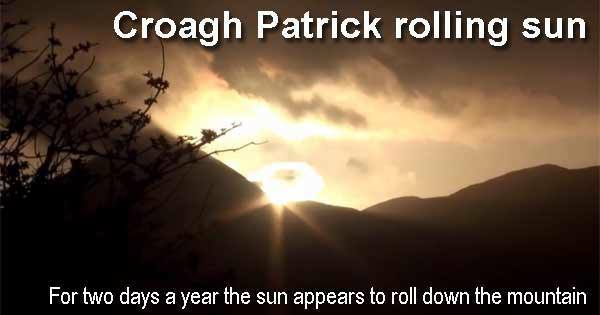 For two days every year you can see what is known as the ‘Rolling Sun' when you look at the mountain from St Patrick's chair. The dates are April 18 and August 24, dates which along with the winter solstice divide the year into three. The Rolling Sun is when the sun sets at such an angle that it appears to be rolling down the mountain rather than disappearing behind it. You can see the Rolling Sun on April 18th and August 24th. As the sun sets, it appears to roll down the north slope of Croagh Patrick on 2 days in the year. The spectacular event takes about 20 minutes. Come along next Monday 18th April to Brackloon Community Centre 7.30pm to hear archaeologist Leo Morahan speak about the Boheh Stone and Rolling Sun. This is a moderate walk of 2 kilometers and is open to everyone, meeting and registration at Brackloon Community Centre at 7.30pm. Refreshments will be served at the community centre with a brief talk before setting off the Boheh Stone. A cover charge of 5 euro will be applied.